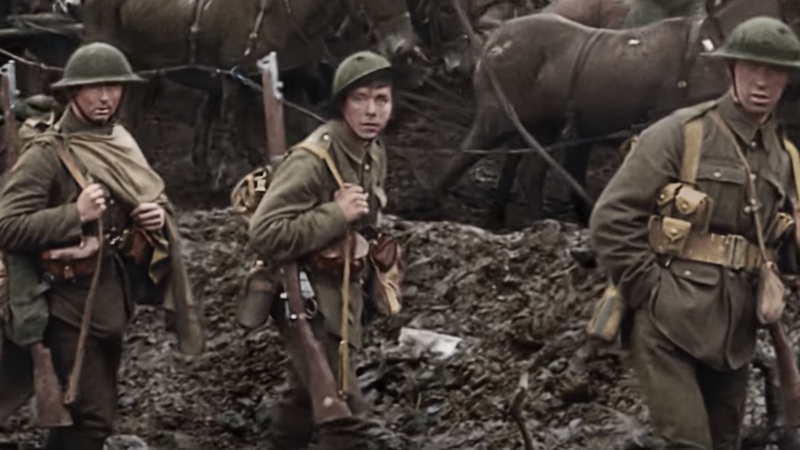 If you like history as much as old movies, Oscar-winning New Zealander Peter Jackson has a treat for you – THEY SHALL NOT GROW OLD, a World War I documentary utilizing 100+ year old footage from the Imperial War Museum (most of it never viewed outside there) to tell the story of the British Empire’s infantry during The Great War. Jackson was given access to hundreds of hours of actual film and audio and commissioned to create something “unique and original”, and with the aid of modern technology he certainly succeeded in his mission. Jackson’s narrative is told through the eyes of the young men and boys (some as young as 15) as they go through enlistment and boot camp, training to kill the enemy, then follows them to the Western Front, where they encountered not only battles in the trenches, but dysentery, rats gnawing at their fallen comrades, lice infestations, and other horrors. World War I also introduced the planet to such military practices as using tanks, bombs, flame throwers, and deadly gasses to gain an edge in slaughtering thousands of young soldiers, over nine million of whom were killed in this “War To End All Wars” (as WWI was unironically called back then). The screening I saw featured another interesting treat – a 30 minute “making of” documentary with Jackson explaining how he went about turning all that ancient footage into something that would appeal to the modern audience’s eye. Much of it was shot at different speeds, and Jackson and his crew painstakingly set about to slow things down and present the cameramen’s original intent. Intricate cleaning processes were used to erase scratches (some, not all) and brighten the footage to show a clearer picture, and matte painting, rotoscoping, and CGI were used to bring the antique silent footage to vivid life. 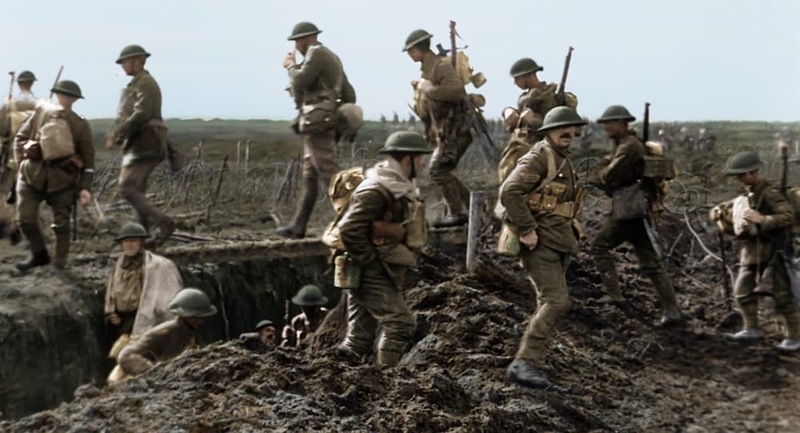 Colorization was added for the bulk of the narrative, for as Jackson says, the soldiers “saw a war in colour, they certainly didn’t see it in black and white”. 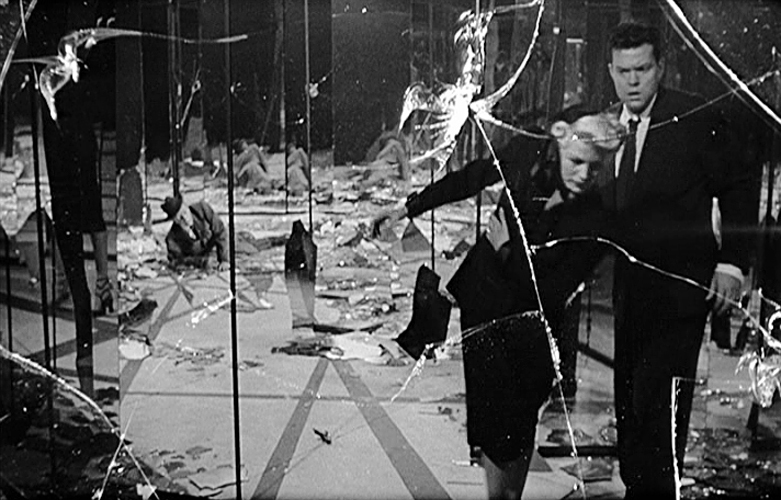 Besides the arduous computerized restoration, the soundtrack features actual voices of survivors of the war, recorded a half-century later for posterity by the BBC. These are the men who were there on the battlefront, telling what it was like through their eyes; sometimes humorous, sometimes chilling, always shocking. 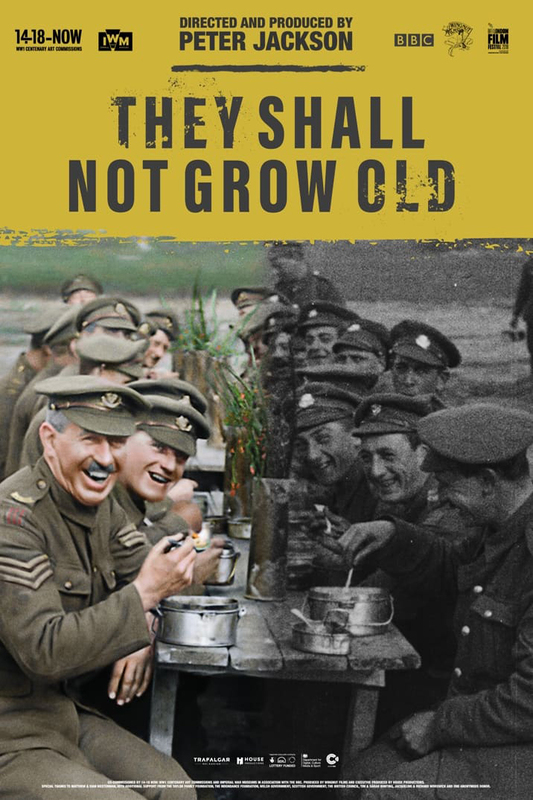 THEY SHALL NOT GROW OLD allows them to tell their own story, and is a dazzling cinematic experience that’s now in theaters around the world, but due to Academy rules on release date (the film premiered December 17 in limited release), it was not eligible for Oscar consideration – nor will it be in 2019. But don’t get me started on THAT subject. 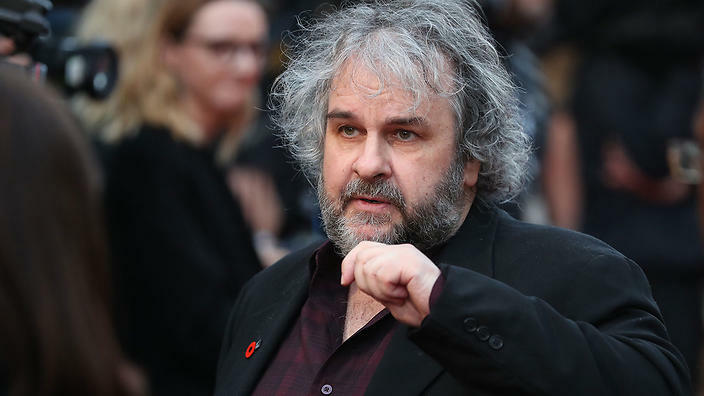 I don’t want to distract from the power of Jackson’s marvelous film, both as an achievement in what can be done to bring historical film footage back to life, and as a monument to those brave souls who endured the horrors of life during wartime. Saw it last month- in one work- remarkable! You saw the film AND a documentary on the making of…? Man, you must live right. I can’t wait until I can see both, too. Thanks for this fab review! I really want to see this and stupidly missed it when it was shown on the telly in November over here. Though I did record it and had a little flick through. I fell onto the soldiers on their horses!!. Riding through the field with an almighty explosion. The hairs on the back of the neck were up and you could feel the colour go my face. My daughter watched that sequence too and we both could feel it’s horror. As she’s been studying WW1 for A-levels we will both be watching it soon, just gotta find the time in-between her studies. So hopefully soon. It does look incredible and it really brings it home and makes it all look so unbelievably recent. What with November last year being the hundred anniversary it was a somber month. Such a mind boggling pointless war!! Blackadder Goes Forth finale still hits the heartstrings.